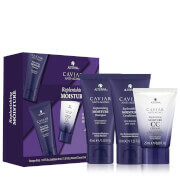 Alterna Haircare's Caviar Multiplying Volume Duo Gift Set is a duo of their best-selling, high performance Shampoo and Conditioner from their Caviar Anti-Aging Volume collection beautifully packed in a Christmas themed gift box. A sulphate-free cleanser that builds thickness and volume, protects colour and improves the overall appearance of fine, thin hair. A sulphate-free conditioner that builds thickness and volume, protects colour and improves the overall appearance of fine, thin hair. Shampoo: Massage throughout wet hair and rinse thoroughly. 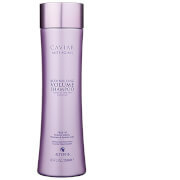 For best results follow with Caviar Bodybuilding Volume Conditioner. 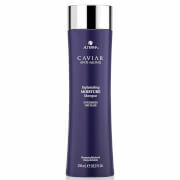 Conditioner: After shampooing with Caviar Bodybuilding Volume Shampoo, massage conditioner throughout wet hair and rinse thoroughly. Shampoo: Water (Aqua), Cocamidopropyl Betaine, Sodium Methyl 2-Sulfolaurate, Disodium 2-Sulfolaurate, Sodium Methyl Cocoyl Taurate, Lauramide MEA, Acrylates/Vinyl Neodecanoate Crosspolymer, Glycereth-26, Caviar Extract, Algae Extract, Helianthus Annuus (Sunflower) Seed Oil, Macrocystis Pyrifera (Kelp) Extract, Linum Usitatissimum (Linseed) Seed Oil, Butyrospermum Parkii (Shea) Butter, Keratin, Hydrolyzed Keratin, Biotin, Phospholipids, Saccharomyces/Magnesium Ferment, Saccharomyces/Copper Ferment, Saccharomyces/Silicon Ferment, Saccharomyces/Zinc Ferment, Saccharomyces/Iron Ferment, Hydrolyzed Vegetable Protein PG-Propyl Silanetriol, Superoxide Dismutase, Ascorbic Acid, Polysilicone-15, Tocopherol, Glycerin, Panthenol, Sodium Lauroyl Sarcosinate, VP/DMAPA Acrylates Copolymer, Cetrimonium Chloride, PEG-150 Distearate, Disodium EDTA, Citric Acid, Butylene Glycol, Tetrasodium EDTA, Phenoxyethanol, Potassium Sorbate, Hydroxypropyl Cyclodextrin, Silicone Quaternium-8, Silicone Quaternium-16, Benzalkonium Chloride, Undeceth-11, Butyloctanol, Undeceth-5, Iodopropynyl Butylcarbamate, Methylchloroisothiazolinone, Methylisothiazolinone, Fragrance (Parfum). (10-15-34259). Conditioner: Aqua/Water/EAU, Cetearyl Alcohol, Cyclopentasiloxane, Butylene Glycol, Stearamidopropyl Dimethylamine, Quaternium-91, Polysorbate 60, Cetrimonium Bromide, Cetrimonium Methosulfate, Panthenol, Wasabia Japonica Root Extract, Foeniculum Vulgare (Fennel) Seed Extract, Hydrolyzed Ulva Lactuca Extract, Hydrolyzed Algae Extract, Algae Extract, Caviar Extract, Linum Usitatissimum (Linseed) Seed Oil, Butyrospermum Parkii (Shea Butter), Saccharomyces Lysate Ferment, Saccharomyces Copper Ferment, Saccharomyces Zinc Ferment, Superoxide Dismutase, Lactoferrin, Daucus Carota Sativa (Carrot) Root Extract, Retinyl Palmitate, Phospholipids, Corn Oligosaccharides, Copper Lysl Oxidase, Acetyl Methionine, Acetyl Serine, Amino Acyl tRNA Synthetase, Phytosphingosine, Ganoderma Lucidum (Mushroom) Tyrosinase, Lentinus Edodes Tyrosinase, Glycine Soja (Soybean) Seed Peroxidase, Peptone, Hydrolyzed Soy Protein, Glycine Max (Soybean) Symbiosome Lysate, Pikea Robusta Extract, Adenosine Triphosphate, Niacinamide Polypeptide, Ascorbic Acid Polypeptide, Pantothenic Acid Polypeptide, Papain, Bromelain, Melanin Silanetriol, Glycoproteins, Hydroxypropyltrimonium Hydrolyzed Soy Protein, Hydrolyzed Oat Protein, Hydrolyzed Wheat Protein, Hydrolyzed Yeast Extract, Hydrolyzed Corn Protein, Hydrolyzed Vegetable Protein PG-Propyl Silanetriol, Guar Hydroxypropyltrimonium Chloride, Dimethiconol, Hydroxyethylcellulose, Polyquaternium-55, Polyquaternium-10, Quaternium-91, Amodimethicone, C11-15 Pareth-7, Laureth 9, Trideceth-12, Glycerin, Propylene Glycol, Disodium EDTA, Citric Acid, Parfum/ Fragrance, Methylparaben, Methylisothiazolinone, Methylchloroisothiazolinone, Geraniol, Hexyl Cinnamic Aldehyde, Limonene, Linalool.